What kind of students does ESAC accept? ESAC accepts students who demonstrate that they are capable of studying and traveling overseas, meaning, we seek students who are curious, strong, independent, can cope with change and different environments. We want students who are flexible and can roll with language and cultural barriers and who are willing to take responsibility for their own actions and behavior. We want easy going people who don’t panic at every turn and can adapt to things like food, heavy travel, long walks and live without the comforts of home. Is this you? – If you have so called “International phone” which uses SIM card and GSM you can bring it to Prague and use your provider’s International plan – check with your provider for details. – If your phone is unlocked you can buy local SIM card in Prague and use pay-as-you-go plan which is inexpensive option for local calls and mobile Internet. – Another option is to buy cheap used phone in Prague with the SIM card. – There is WiFi in the residence hall, on the campus and in many cafes and restaurants where you can use Skype or other VoIP programs to call home for free. How do I know a program based in the Czech Republic is right for me? This short-term study abroad program, based in Central Europe, is designed for college students engaged in business, hospitality and humanities. Students from anywhere in the world are encouraged to apply, particularly if interested in an internationally focused program. Can I have extra transcripts issued? Yes, we can issue an extra transcript(s) for an additional fee of $25 each. Contact ESAC directly to request an extra transcript(s). Your first transcript after you finish your classes is free. I would like to change my class – is it possible? Yes, you can change your class registration. If you change your class registration after February 15 there is a “Class change fee” of $150. Is Prague a safe and user friendly city? The beautiful capital of the Czech Republic remains one of the most popular destinations for students to participate in educational programs. It is a very safe place to travel and study and it is easy to get around either by walking or public transportation. The airport in Prague is Vaclav Havel Airport Prague (PRG), (formerly called Prague Ruzyně International Airport), which is located approximately 15 kilometers outside of Prague’s historical center and has daily connection from/to major European cities and some cities outside of Europe. It is also easy to get to the Czech Republic from anywhere in Europe by train. Remember, in summer the international trains tend to be full and you should book your seat at least a few days ahead. Most international trains arrive at Praha Hlavni Nadrazi (Main Station). Will I have Internet access to keep in touch with family and friends while I am there? There is Wi-Fi Internet access in the residence hall and on the campus and it is included in the program fee. You are not required to bring a laptop for the ESAC program, it is optional. If you choose not to bring your laptop, you can use internet cafes around the city as an alternative. It is not expensive and it is very convenient. When I arrive, will someone meet me at the airport? Yes! If you arrive the day the program starts, we will be at the airport and provide you with a transfer to your accommodation. Upon arrival at the residence hall, receptionist will welcome you and help you check in. That evening there will be a welcome party for the entire group so you can meet your peers. Traditional academic sessions are held on-site in modern classroom facilities, followed by lunch and afternoon class sessions. A small amount of prep work is required up-front as part of an on-line pre-departure session designed to ensure all students are adequately prepared for their four-week stay overseas. While you will be expected to be in class each day and do your homework, the Professors understand that you are only here for a short time so the work load is well balanced. Will I have any free time to go site seeing or travel independently? Yes! We recommend that you take full advantage of your free afternoons and weekend to travel around the city of Prague or to nearby villages. Local advisors are on hand to offer you recommendations of some excellent site seeing. First, do not panic. Panicking will make it worse. Be calm and either go to the medical clinic which is our provider or call them and make an appointment to see the Doctor on staff, who speaks fluent English (appointments phone: 224-220-040). The clinic is called Health Center Prague. It is a full medical facility, very modern and very efficient. You do not need to contact a member of staff if you are sick, just go straight over to the clinic and see in to see the Doctor on staff. The address is Vodickova 28. They provide house and hotel calls for emergency 24/7 – tel. : 603-433-833. Pharmacies in Prague are easy to identify by the bright green medical logo located outside the doors. Pharmacies are well-equipped with medicines for the common cold to prescriptions, all at reasonable prices, and pharmacists usually speak some English. Who do I contact if I need mental health assistance or therapy? You will contact Dr. Veronika S. She is a licensed therapist with a PhD. from the United States. You will call her directly and arrange an appointment. Her office is located near IP Pavlova metro stop on Londynska street and her direct phone number in Prague is: 602 173 770. You can also email her directly: veronika_us@yahoo.com – all conversations are strictly confidential. You do not need to inform anyone that you will be seeing the therapist, this is completely up to you. Her cost is 800 CZK per hour and it is not covered by your health insurance plan. What is the nightlife like in Prague? What if I arrive early or wish to extend my stay in Prague at the residence hall? Students cannot check in to the residence hall until the program start day. However there are many reasonably priced hotels or hostels in Prague where you can stay before the program starts. Students have to check out of the residence hall on or before the official final day of the program. If you wish to extend your stay in Prague we recommend Mosaic house. Do I need a visa for the Czech Republic? North Americans do not need a visa for any country in Europe. If you are participating and you are not sure if you need a visa, you can check with the local Czech consulate in your country. They can advise you if a visa is necessary, how long it will take to process and how much it will cost. 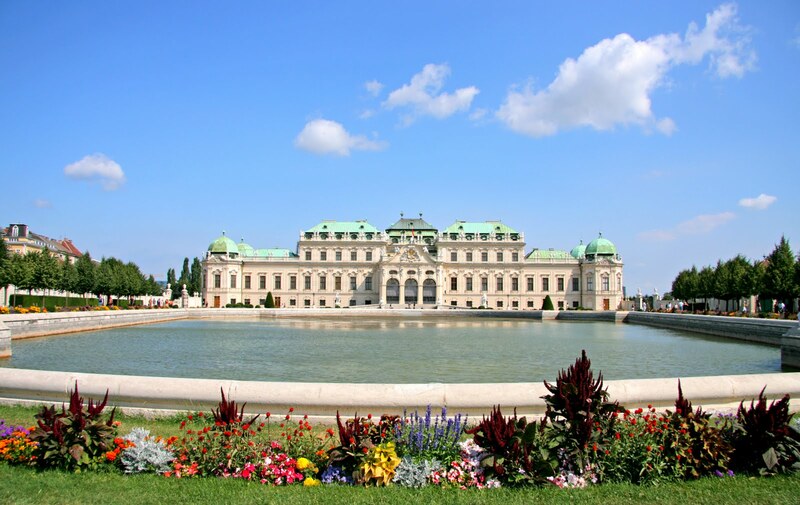 You should also check to see if you require a visa for the excursions destinations (Austria) and any other countries you wish to visit in Europe on your own. No, the cost does not include your plane ticket. If you check with STA Travel or other student travel agencies well in advance, they can usually help you secure a student discount rate. Remember, July is high season for flights to Europe, so begin checking around early. Consider all your options; you may find it better to fly through London, Amsterdam, or Vienna depending on where you are coming in from. How much extra money should I bring and how should I exchange it into Czech currency? Prague is still relatively inexpensive in comparison to other European destinations. A rough estimate would be to bring along an extra $1600 to $2000 for spending money. Bring an ATM card and withdraw money as you need it. That is the best way because you get that days exchange rate and you can withdraw a bit of cash every few days so you do not have large amounts of money lying around, that is what we do and it is the safest and most reliable way. You can bring cash USD and exchange it in Prague but your exchange rate will not be as good. Credit cards are widely accepted. Inform your bank that you are traveling so that they do not freeze your card! International Education Financial Aid – premier resource for financial aid, college scholarship and grant information for international students wishing to study abroad. International Student Loan – provides loans and financial aid to international students around the world. Additional scholarship information can be located here. Housing for this term is located in the residential neighborhood of Zizkov, in a recently renovated building, close to public transportation. Travel time from the residence hall to the classroom is about 20 minutes using public transportation. There are numerous shops, restaurants and pubs nearby. All rooms have 24/7 access to Internet through Wi-Fi if you bring your own laptop or phone. The residence hall is clean and spacious but it is not a five star hotel. It comes with linen and towels. Laundry facility is provided in the building for a fee (about $3/load) and irons, ironing boards, and fans can be borrowed for a fee. Yes, you can pick your roommate if you want to. There are other people living in the building so noise levels must be kept within reason after 10:00p.m. Are my laptop and personal belongings safe in the residence hall? Most thefts on campuses and in the residence halls are crimes of opportunity. Yes, your personal items are secure in the residence hall as long as YOU always lock your door when you and your roommates are not there. All rooms have locked cupboards where you can lock your laptops and personal items. Students are encouraged to keep doors and windows locked, not to prop exterior doors and not to leave belongings unattended. You are strongly advised not to bring expensive clothing or jewelry to Europe when traveling. You should always bring with you things you are not attached to as there have been cases of students forgetting their handbags or luggage on trains and buses. What should I bring with me to Prague? Laptops are highly recommended but not required by ESAC for your courses. It is handy for keeping in touch with family and friends back home and it will make researching your travel destinations easier. Get a high quality suitcase with wheels and bring only one piece, as you will be carrying your luggage throughout Europe and that means you carry it! 2 pairs of comfortable walking shoes, one pair of gym shoes, one pair of nicer shoes for site visits. No high heels! Acquiring guidebooks or maps of the region will also come in handy. Bring enough clothing to last you for four weeks with out overdoing the load! Students will be responsible for the laundering of their own clothes. Laundry facilities are readily available in your residence hall (about $3/load) and Laundromats in Prague are inexpensive. *Note: The clothing that you bring to the host country should reflect the weather conditions for the site during the term you will be working. In Central and Eastern Europe, summer can be anywhere from 50 degrees to 95 degrees (10 – 35 degrees Celsius). Prague can be very hot in July. It may rain so be sure to pack an umbrella or light raincoat. How do I get to the residence hall on my own? Residence hall is called Hotel Jarov I.E. – VSE. 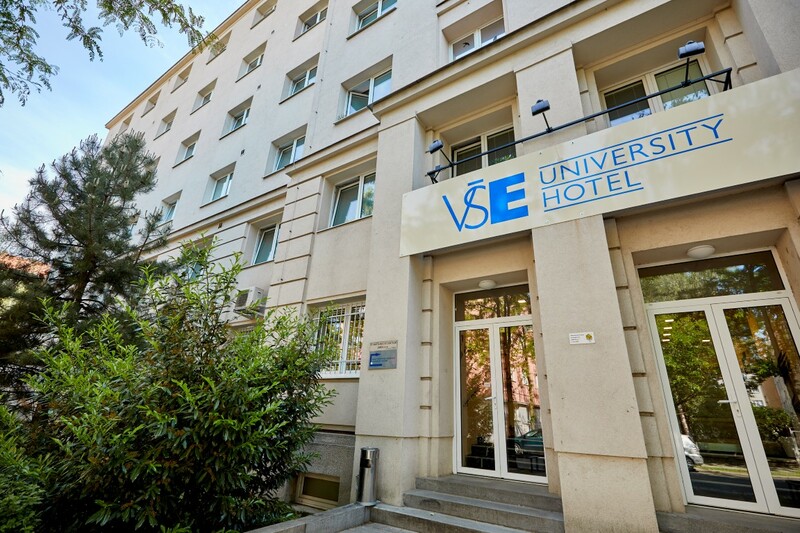 The address is: Konevova 196, Praha 3, but the reception entrance is from Jeseniova street around the corner (photo). Closest tram stop is called “Strážní”. It serves trams #1, 9 and 11. Directions from Hlavni nadrazi (Main train station): Take tram number 9 from Hlavni nadrazi tram stop, direction Spojovaci. It is about 20 minutes to Strážní tram stop. Follow the main road and turn right at Jeseniova street (1 block from the tram stop). The residence hall entrance is on your left-hand side (photo). Directions from bus station Florenc: Take Metro C line (subway) directly from Florenc, direction Haje. It is 1 stop to Hlavni nadrazi. Exit the metro and follow the directions form Hlavni nadrazi above. You can take Uber (preferable, safer) or taxi (more risky, could be overcharged) from either station. Fare should be around 300 CZK ($15). 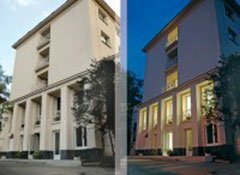 Do I need electric adapter in Prague? The electric voltage in Prague is 220V and electric plug is C/E type. You can check your electric equipment if it is fit for 220V. 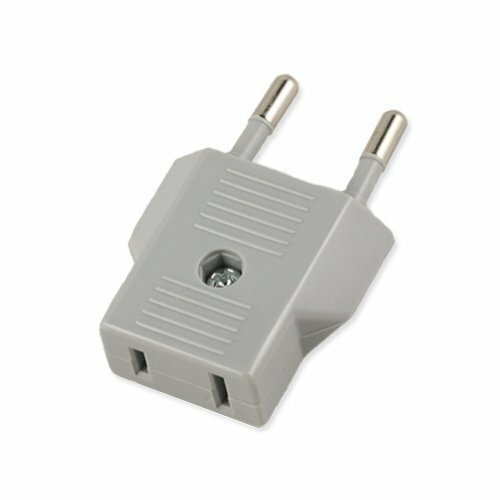 If not you will need electric converter from 110V to 220V, otherwise you will need just an electric plug. It can be bought at home (easier) or in Prague. ESAC accepts checks, money orders, cashier’s checks, wire transfers and credit cards (through PayPal where available, additional 3% PayPal processing fee applies). Using PayPal you can pay by credit card, debit card or by PayPal balance. Add 3% PayPal processing fee. Please choose the required payment amount below. 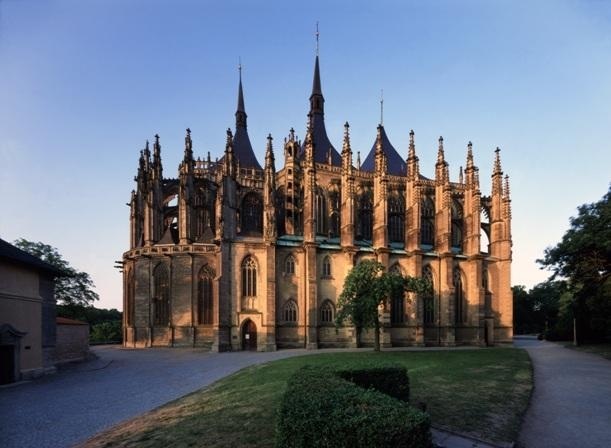 Day trip to medieval city of Kutna hora is included in the cost of the program. We will leave in the morning on private coach and about an hour later will arrive to Kutna hora. It is an ancient silver mining town and it used to be a second most important city in the medieval Kingdom of Bohemia after Prague. 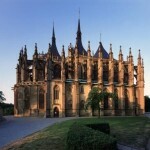 There is a bone church in nearby town of Sedlec which you can visit as well.